Real Journeys in Technology is a core K-12 technology curriculum for that is ideal for both computer labs and classrooms. Built around a scope and sequence of 500 learning objectives in ten key technology areas, Real Journeys in Technology meets or exceeds state and ISTE NETS standards. Included in each color-coded grade level kit is a full-year's curriculum containing thirty-five interactive project-based adventure-themed lessons. Real Journeys in Technology is available for PC's and utilizes such software as Kid Pix Studio Deluxe, Print Artist Gold, and Storybook Weaver Deluxe for the K-2 levels and Microsoft Office for 3-8 grades. 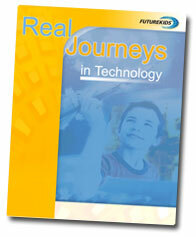 Real Journeys in Technology is available for PC's utilizing Scholastic Keys software for grades K-2 and Microsoft Office, XP or 2003 for grades 3-8. Each classroom kit is color coded so that teachers may choose the level most appropriate for their classes. Each kit contains a comprehensive Teacher Guide, 25 Student Workbooks and a CD-ROM containing electronic templates, samples, and handouts.